UCI has partnered with Nationwide® to offer discounted pet insurance effective February 1, 2018 to all UCI employees. 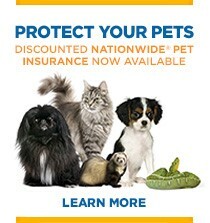 Nationwide’s pet insurance program was founded by veterinarians, and is the oldest and largest pet insurance program in the U.S.
Coverage is available for dogs, cats, birds, reptiles, and exotic pets. Members are free to use any veterinarian worldwide, including specialists and emergency care providers. You can enroll anytime, and payroll deduction is available. You must enroll by the 15th of any month for coverage to be effective the first of the following month. Please visit the UCI Pet Insurance web page to register for an information session or webinar, request a quote, and find out more about coverage available.